London Boerse: On the road for a European stock Exchange? The London Stock Exchange shares jumped on Tuesday’s afternoon after Reuters reported the company managing the City’s Exchange was engaged in merger talks with Deutsche Boerse. Deutsche Boerse had a capitalization of €14.3bn while the LSE (which also owns Borsa Italiana) one was a little over €10bn, before Tuesday’s rise of the shares by more than 10 percent, up to £25.50. The resulting stock exchange would be worthe approximately £28bn. People familiar with the matter reported that Carsten Kengeter, former banker at UBS and current CEO of Deutsche Börse would serve as chief executive of the new company while LSE current chairmen Donald Brydon would become its chairman. Allegedly the current plan sees a newly created holding company launching a tender offer to both LSE’s and Deutsche Börse’s shareholders in return for shares in the combined entity. The reports also suggest that the new company should be headquartered in the City, bolstering further London as the European financial capital in a moment when political ties of the UK with the EU are set to be decided in an impending referendum. Retaining the domicile in London would allow the LSE and the U.K. government to describe the deal as reinforcing London’s position as Europe’s international financial center. However, the decision regarding the domicile is all but certain and will very likely depend on the outcome of the referendum. Indeed while the Brexit dilemma will receive its answer on the 23rd of June, it is worth nothing that the failure of the two previous merger attempts between the Britain and German stock exchanges was tied with British feelings regarding a national institution being shipped abroad. Such sentiments could not be more vivid four months ahead of the referendum. Perhaps, in a likely attempt to hamper such feelings, the deal has been named a “mergers of equals”. Well, it is not. Splitting according to earning and taking into account debt, 64 percent of the ownership of the new stock exchange would pertain to the German company owners, however the reports suggest they control 55 percent of the stake. The rest accounts for a control premium. The rationale behind combining the LSE and Deutsche Börse remains firmly commercial: the deal is primarily being driven by derivatives as instruments such as futures and options command higher margins and are harder for rivals to replicate. While LSE focuses on cash markets and post-trade business, Deutsche Börse already has a large derivatives business, indeed it has control over Eurex Clearing, one of the biggest clearing houses in the world which provides for more than half of the German company earnings. Although market users might welcome lower costs, the regulatory pushback here might be considerable. The following table provides a graphical representation of the consolidation in the market of stock exchanges. A few global and diverse exchanfe operators are dominating the landscaper. A first tangible threat to the impending deal is represented by the European Commission, which already prevented a deal between NYSE Euronext and Deutsche Börse in 2012 over concerns about creating a monopoly. 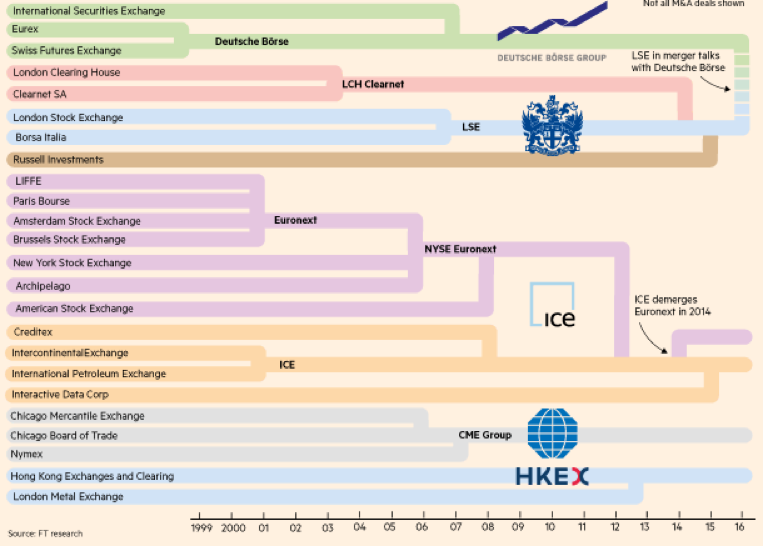 The second main threat to the deal comes from the market: the direct competitors to the newly created “London Boerse” would be the the Intercontinental Exchange Inc. and CME Group Inc, both U.S. firms. Indeed the two have much to lose if a European rival gets big enough to pose a formidable challenge to its increasing market share on the continent.